Bob Ward of the State of Confusion | Watts Up With That? Bob Ward’s tweets today have been a revelation – historic even – see the Bish’s post here. 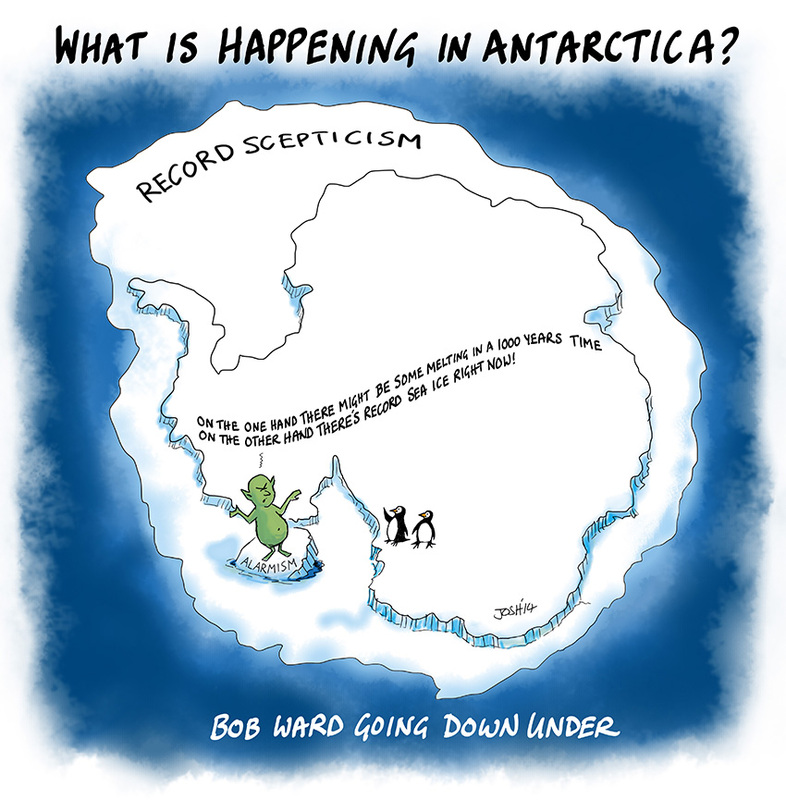 Happily they have coincided with a couple of Antarctic stories that deserve cartooning. Thanks, Bob! May 13, 2014 in Antarctic, Humor, Satire. OMG, that’s funny. Thanks Josh for a happy good morning. Love your crazy, zany mind as usual, Josh. I’ve long believed that only humour can crack ideological thinking because (I think) humour must reside in a different part of the brain than does logic. Humour allows breakthroughs. I’m in eastern Australia where it’s 10.45 pm on a Tuesday night so goodnight, Wyguy, and everyone else who are starting a new day. A nice (unintentional) illustration that, for many people, understanding how Antarctic sea ice could grow while a portion of the Antarctic ice sheet could retreat is beyond comprehension. Throw a little real world complexity at people and an all to common reaction is to conclude that if they don’t understand it, it must be wrong. The hyperbolic story is on CNN’s front page right now. I just read the story and it ways “it may take several hundred years for this area to melt, if it does.” It also, in the first paragraph, states it’s due to “warm ocean currents and geographic peculiarities.” The article also clearly states that this is not uncommon or unprecedented. However, that didn’t stop CNN from posting a “breaking news” headline of MASSIVE ICE MELT APPEARS UNSTOPPABLE, all in red letters. A video of an animation is above the body of the article, complete with scary/ dramatic music over it. Unfortunately, for many voters, all it takes is the headline. The simplicity of the cartoon makes it an art form. A soundtrack accompanying your cartoon can be ‘It’s a Heartache’ by Bonnie Tyler. (And this includes the weather media such as the awful “Weather Underground”…just STOP using them!). very effective, very good cartoon!! As as good as the Telegraph at its best. Perhaps some twiddling of the lyrics of “Ice, Ice Baby” would be appropriate. CNN and this paper separated at birth. 1. Select and copy your long URL into your clipboard. 3. Paste your URL into the box where the cursor is positioned. 4. Click the Shorten URL button. If one claims that the temperature in the stratosphere does not affect the climate are to a large error. Please look at Antarctica. The Antarctic ice melt is unstoppable — so what’s the point? We must stop all carbon emissions immediately, because it’s too late? Seriously, these guys are clueless. (y) 😉 Best in the early morning. One of the many back stories to the two almost published papers is that Eric (Rignot) has been harping on this for almost a decade in his rise to fame (mostly at AGU) and his feud with Jay Zwally. On another note, all glaciers have a seasonal cycle of dynamics, a combination of sliding on their (watery) bed and ice (glacier ice) deformation with some calving if terminated in water (sea or lake). The end of summer in Antarctica occurred roughly toward the spring equinox and all the glaciers were sliding at their maximum and of course the upper parts will feel to pull. By the early Antarctic winter the sliding will stop, along with pull and nothing will be noticeable until the next year’s end of summer when the sliding and calving are in full again. CNN and this paper separated at birth…. The B-52 Stratofortress as a WW2 bomber? The Eighth Air Force could have bombed the Nazis back to the stone age in a week with just one of those. But I suppose if a B-52 can be transported to the moon, at can go back in space and time to 1943 as well. If melting of the Antarctic will cause [sea] level rise, where was all the water when it was a lush green continent millions of years ago. at least three short stories in that one link alone! so with expansion of the water the seas should have been really high. Is that penguin giving Bob the bird? Ward’s antics remind me of the child who is going to hold his breath until he gets his way. I wonder if everyone ignores him, will he pass out eventually? Rignot is just trying to ‘pull a Zwally out of the interferograms.’ A.g. Zwally’s comment about the Arctic Ocean without sea ice in 2010. The water was on the land as epicontinental seas & higher coasts. Sea level was high during the Eocene, before the onset of Antarctic glaciation, but even more so during the Cretaceous, when seaways covered North America from the Gulf to the Arctic. Thanks Josh, but I just have to go into sarcasm here: Oh that EVIL reality, it never follows our wise and true computer simulations !!!! The only addition I could suggest would be to have “The Ship of Fools” stuck in the alarmism iceberg. Q1. How much sea level change do you expect world wide should the arctic ice melt completely? Note this refers to ARCTIC ice which is floating ice. Therefore the answer to question 1. is ZERO as floating ice displaces its own weight in water, making no difference in any level change. The picture refers to Antarctic ice which rests on land and therefore would have a effect on sea level should it melt. Note your reference does NOT give a figure for sea level change for the Arctic. Although it appears to represent fact, on careful read. one realises that the reference (bove) is simply hypothesising that “should the Antarctic Ice cap etc. melt, and omits to mention as far as I can see, that total Antarctic ice has been and is INCREASING in volume. Q2. There is no doubt that should the Greenland ice cap melt completely there will be up to approx. 6 meters of sea level rise. What is the time period given by the IPCC in which the Greenland icecap is expected to completely melt? Interesting that they have almost knocked a thousand years off the melting time with some clever wording although they do not appear to be forecasting any increased rate as a result of any recent “scientific” research. 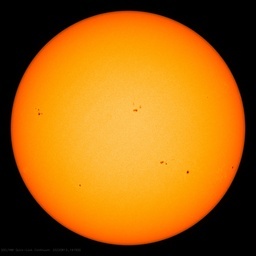 Still think there is a prob from Antarctica?